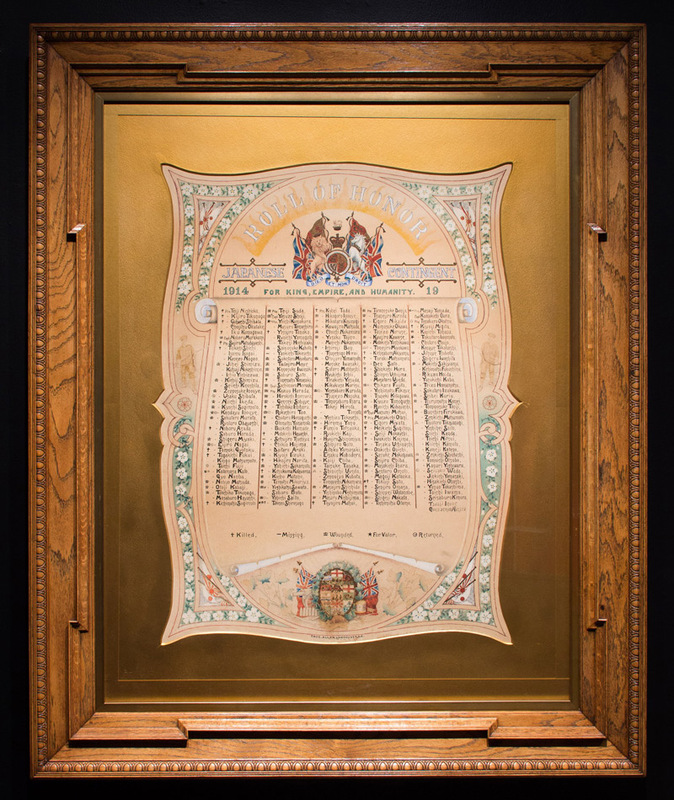 Roll of Honour, circa 1920. Loan courtesy of Vancouver Japanese Language School and Japanese Hall. 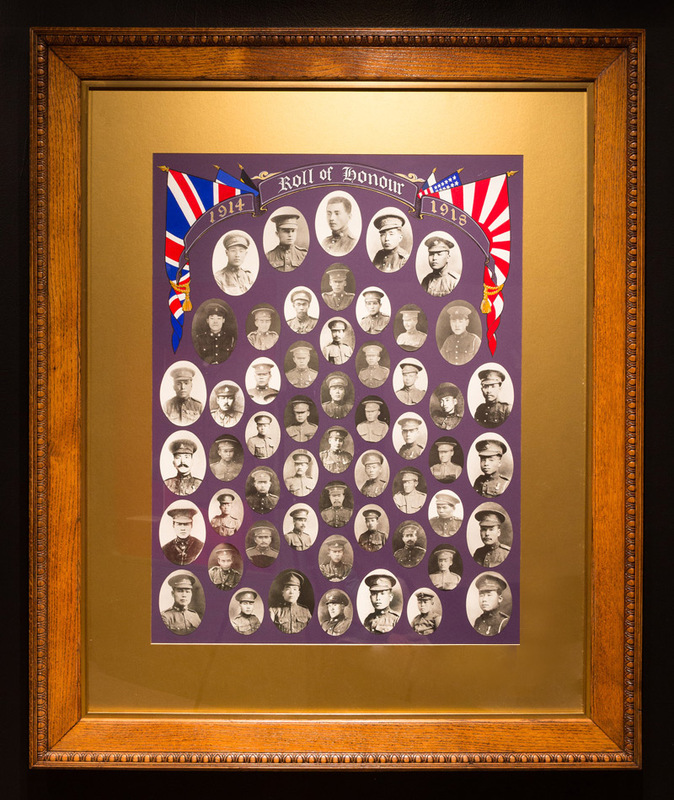 The Roll of Honour, usually displayed in the Vancouver Japanese Language School, features photographs of the Japanese Canadian soldiers who died during the First World War. 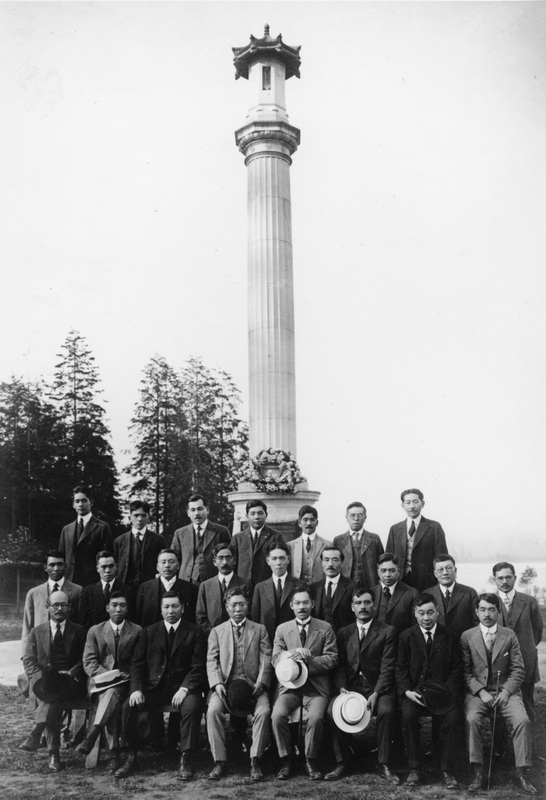 Along with the Japanese Canadian War Memorial in Stanley Park, which was erected by the community on the third anniversary of the battle of Vimy Ridge in 1920, the Roll of Honour is a strong reminder of the Japanese Canadian community's enduring pride and gratitude for the young men who sacrificed their lives for their adopted country and for their community. When the community was forced to leave Vancouver in 1942, Corporal Sainosuke Kubota, secretary of the Japanese Branch #9 of the Canadian Legion, BESL, took the Roll of Honour with him. He safeguarded the tribute and the Legion flag for twenty-five years until he brought it back to its home in Vancouver for the celebrations of the Japanese Canadian centennial in 1977. A descendant of samurai from the famous Satsuma region of Japan (known today as Kagoshima), Kubota considered returning the Roll of Honour to be his final obligation to his comrades; he passed away the following year. Surely the setting sun will rise again for you. We take the torch from your hand to fight and carry on. Every soldier who took part in the First World War fighting under the British flag was awarded the British War Medal. In addition, each soldier who fought until the Armistice in 1918 was awarded the Victory Medal. The Military Medal, a level 3 Gallantry Award in the British army, was instituted on 25th March 1916, and awarded for acts of bravery from as early as 1914. It was an award for heroism and devotion to duty when under fire in battle on land. On the reverse of the medal is inscribed “For Bravery in the Field”. Recipients of the medal are entitled to use the letters M.M. after their name. The Cross of Saint George was an Imperial Russian decoration awarded for acts of distinction under arms. Two Japanese Canadians fighting for Britain were among the recipients from the tsar. The following is a list of Japanese Canadian Military Medal and Cross of Saint George honourees.